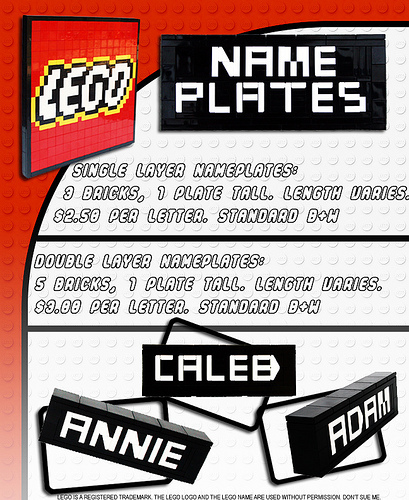 If you want a brick-built name plate at a low price, AceBricks has them for sale. For just $2.50 – $3.00 per letter, you can get one made for a 10 letter name for as low as $25. Check out the details on Flickr. Eli Carter sells similar name plates. His are more expensive, but you can see what it will look like when built. Plus, he offers them in more colors than black and white. The letters are built differently as well. This is very low priced. :D I don’t think you can find this quality for a better price. Glad you posted it! Disclaimer or not, they’re likely to run into real trouble from TLG’s legal department over their unauthorized use of the LEGO logo. @GrandPappy: Thanks for the kind words about https://brickbuiltnameplates.com! My nameplates are about twice as tall and twice as long as his are. The body of his nameplates is 2 studs deep, while mine are 3 studs deep, plus a fourth stud for a rear “foot”. His nameplates sit flat, mine lean back a little to better match the “desktop nameplate” form. No mention of instructions; mine come with full step-by-step instructions on CD. You get to build your own nameplate. He doesn’t specify what other colors are available, but they cost more; the colors I offer are all the same price and it only takes a click to pick them. If you want to see what your nameplate looks like, you’ll have to ask him for a picture; for mine, you just type whatever you want and it will render it for you immediately, in color, so you can try out different ideas quickly. 1. That may mean there are some intricacies on the backside; and given a 2-stud depth, I expect that will “show through” on the back–but without any rear pictures I can’t be certain. My nameplates have a solid brick back. 2. Alternatively, the back of the nameplate is solid brick, and the lettering is friction fit into the frame. (Which is what it *sounds* like from his description of how he’d build an “R”.) I would not consider that sturdy — a nameplate in his style built in this way, when turned face down will dump parts out. My nameplates won’t fall apart even if you tap them face down on a hard surface. 3. As above, but with an adhesive between the backing and the parts in the letters… such as glue or a thin double-sided tape. My nameplates don’t use any adhesives; they are completely brick-built. My nameplates are constructed with solid connections for all parts, or they are “trapped” by parts which have solid connections. I don’t rely on a friction fit or on any adhesive in my nameplates. The interior stud-depth of my nameplates has a lot of complexity in it to accomplish that! Catsy: I technically didn’t use the Lego logo. I used my creation, which isn’t copyrighted. First of all, this is actually kind of funny. I find it amusing that you feel the need to slam a young 14 year old entrepreneurs nameplates just so yours can look better, without ANY of the facts. Almost everything you said is false. No, I don’t have instructions. I ship the nameplates pre-built. I don’t have the means to make instructions just yet. The only reason you are able to have all colors the same price, is because you charge way out of the wazoo for each letter. Your letters are 10.00 each, and the pieces to make those are only like $3-5 dollars POSSIBLY. Probably more like $2-3. I don’t even charge half of what you do, and therefore I have to charge extra for colors that cost more. I can have any color the buyer wants. Whether it be dark blue, lime green, or whatever has the right pieces, I can do it. They just have to be willing to possibly pay a couple of dollars more per letter. Which is still way cheaper than yours. 1) All my backsides are completely made of bricks. No hidden ugly pieces sticking out, no nothing. Just plain 1xwhatever bricks behind the letters. 2) I hold the pieces in by surrounding them in such a way that nothing can fall out.. My letters will NOT fall out if “Tapped” it into a hard surface. The only way they fall out is if the entire nameplate breaks from falling 10ft into a concrete surface. I don’t think anyone is going to be doing that, so there is no problem in that. I bet yours would fall apart if dropped to. Am I not correct? 3) No glue. No adhesive, no nothing. I don’t believe in gluing pieces together. As said above, mine are connected with solid connections or trapped aswell. Hahahahahahaha, oh my, I am laughing so hard. 6 time the size, is that right? Hmm? Your nameplates are 5 bricks tall. Mine are 3 bricks 1 plate tall. Yours isn’t even 2 times the size of mine. Your letters are 3 bricks tall. Mine are 2. I give you a couple things, yeah I like the idea of having people see what they buy, and having instructions to use, but I don’t have those means. I’m 14 as said before. How old are you? Also, your ledge at the bottom to make the letter have an angle are pretty cool. I could easily do that as well, I just decided not to. Again, I don’t know why you felt the need to say all those things. Let people buy yours if they want to buy yours, and let people buy mine if they want to buy mine. Quality speaks for itself, and I have many customers who can back up what I said above.